Paxport Web Services Pvt. Ltd.
Applytics develops software and hardware for preventing counterfeit drugs and other merchandise at the retail level. A manufacturer controlled central database holds unique IDs of all items. A text message or 2D scan from a consumer quickly checks for authenticity and alerts the consumer before he or she makes the purchase. Applytics is also developing a miniature 2D scanner meant to be an accessory for a smartphone. Idea3D is developing alternative filaments for 3D printing. Currently the Fused Deposition Modelling 3D printing industry uses ABS and PLA for filaments. ABS is petroleum based and not environment friendly, and PLA is bio-degradable only under controlled conditions. Idea3D is developing much cheaper filaments from starch and vegetable proteins that are completely environment-friendly. Idea3D is funded by Department of Biotechnology’s Biotech Ignition Grant Scheme. The key founder is a chemical engineering researcher from BITS Pilani Hyderabad campus. (ii)Glucose detection kit which is an order of magnitude cheaper than current commercial options. Funded by Department of Biotechnology’s SPARSH grant scheme, xBITS’ founders are accomplished researchers from Department of Biological Sciences, BITS Pilani Hyderabad campus. Digipartment is developing a suite of tools that help (i) hospitals manage patient flow, doctor schedules, etc and (ii) real estate and construction companies manage site visits, apartment bookings, etc. PSPR 3D Tech (Prosthetic Solutions for Productive Rehabilitation through 3D Printing Technologies), is a trademarked brand for affordable and innovative artificial limbs for patients in India and other developing countries. So far the company has successfully innovated an affordable below-knee prosthesis using reverse engineering and 3D printing technologies thus completely eliminating the use of the environmentally hazardous plaster of Paris. The company's standard version of below-knee prosthesis costs less than Rs. 15,000/-, which is way below the other brands available in the market, while having superior quality of fit and improved durability. This product has already successfully completed fourteen clinical tests, all these patients having reported the best comfort given by PSPR 3D Tech product as compared to other brands of prostheses that they wore previously. Extended clinical tests of the product are in progress. The below-knee prosthesis research of this startup company is supported by a grant from DBT-BIRAC through IKP Knowledge Park under BIG-5 scheme. The company is hosted in Room No. 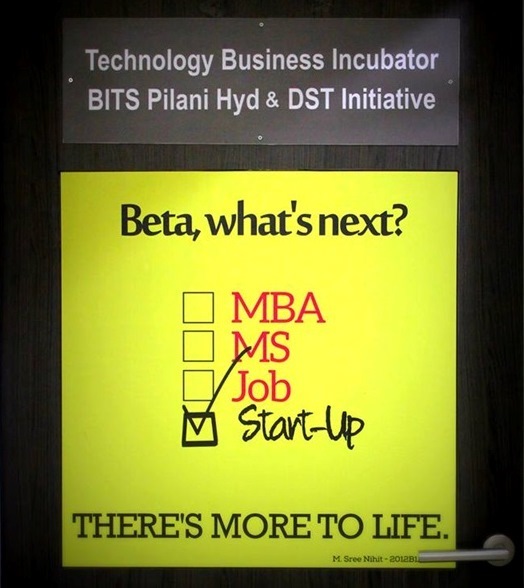 4, TBI, BITS Pilani, Hyderabad campus and has collaboration with Share-India/Mediciti Institute of Medical Sciences, Medchal, Hyderabad. The company has been jointly founded by Prof. Srinivasa Prakash Regalla (BITS Pilani, Hyderabad Campus, 9010202879, regalla@hyderabad.bits-pilani.ac.in) as Director, Prof. Prakash N. Shrivastava (University of Southern California, USA & MIMS, Hyderabad, pshriva@usc.edu) as Director, and Mr. P. V. Shyam (Alumnus of BITS Pilani, Hyderabad Campus, 1993shyam@gmail.com) as Research Manager. The company has so far provided several BITS students the opportunity to work in an industrial product oriented research environment while studying. For more details of the company's cutting edge research and products, please visit www.pspr3d.com. GeneSys Biologics is a science-based Biopharmaceutical company focussed on targeted development of biosimilars (recombinant proteins) and other fermentation based products. Scientific and technical expertise in Biosciences and Chemistry combed with global regulatory capability is the solid foundation for GeneSys. GeneSys key management team consists of successful scientists with exceptional scientific capabilities, advanced proficiency in Bioprocess sciences, in-depth knowledge on characterization analytics, technology transfer, scale-up, quality assurance and demonstrated global regulatory (US, EU, Rest of World) success from clinical development through global approval for biologic molecules. Shared expertise of leadership team is the critical foundation for GeneSys. Y’S is focused on preclinical drug discovery and diagnostics covering a span of therapeutic areas including cancer, neuropathic pain including diabetic neuropathy, metabolic disorders, infectious diseases including TB and ESKAPE infections and neurological disorders. For disease diagnosis, the current focus is on oncology. Y’S is founded by accomplished research professors from the Department of Pharmacy, BITS Pilani Hyderabad Campus. For more information click here. Naturlich Global beverages, a health drink company founded by University of Sheffield grads, has its first product named PureSoul, a non-alcoholic novel functional beverage, naturally fortified with essential vitamins and minerals, produced by microbial fermentation of natural raw materials such as grains, fruits, etc. Health drinks are the future of the global beverage market as many people are shifting towards healthy lifestyle, leading to increase in demand for health drinks or Nutraceuticals market as a whole, giving it a CAGR of 21 %. PureSoul is a prebiotic product developed using our innovative technology, to encounter obesity, diabetes and vitamin B-12 deficiency.Naturlich is funded by the Department of Biotechnology’s Biotech Ignition Grant Scheme. We Make Scholars (WMS) is an online study opportunities search and discovery platform providing information on scholarships, internships & educational service providers globally. We aim to connect the world through education by providing the right opportunities. WMS is a Not-just-for profit startup having its roots developed in accordance to a social entrepreneurship model building the whole venture in a community-oriented way, taking value inputs of students who supported the project sharing their experiences and needs that required to be addressed. The growth of our portal accelerated due to the fact that students couldn’t find a single place where opportunities like scholarships, internships, courses, universities are accessible via smart sorting based on the user preferences. Even before the launch, the idea had a backing of at least 160K students via communities, providing great support & involvement while in the development process of the website, helped to shape it up to meet the needs of prospective students relative to their personal experiences. BoneGraft, founded by an orthopedic surgeon, is developing bone substitute matrix material that is impregnated with bone growth factors. The team is funded by Department of Biotechnology’s Biotech Ignition Scheme. MLPA Tech is developing a device that enables inexpensive and quick genetic diagnostics of copy number variants.The team, funded by the Biotech Ignition Grant Scheme, comprises a faculty researcher from the Dept of Biological Sciences as well as experts in optics and healthcare IT. SSK Biosciences (SSK BIO) is a start-up organization that provides services to major Pharma and Biotech companies world-wide, related to medicinal chemistry products and cationic lipids for drug delivery. Our focus also includes Discovery Research and Development to generate an IP of our own. Research areas that being explored are: Peptide based antibiotics, developing small molecules as drugs in different areas such as, Tuberculosis, Antimicrobials, Neurodegenerative diseases, Neuropathic pain and Cancer. We at Aryarobotics want to eliminate the fatal risk involved in the job of window cleaners by putting robots in the place of men. The robots that we wish to create will be completely portable and will involve minimal installation. This will make these robots suitable to be used in the service sector as carrying them will be easy and the will be able to cater to any and every type of glass structure. Starluxe electrochromics works in the field of electrochromic glasses,flims, mirrors and displays. The first product which is yet to be rolled out is electrochromic film for architectural and automotive use. Starluxe electrochromic film offers a electronically controllable dynamic tint to mirrors and glass which provides the user with direct control over the amount of light and heat that is allowed to pass through the film. This results in glare control and energy benefits upto 30-40% while ensuring a long life for the film, at a price that is very competitive. Kloudisk has developed a workflow management and version control tool for design studios. Kloudisk enables easy storage of updates to large animation and multimedia files on the cloud. Learning Management tool for schools and colleges. AcadCloud has the flexibility to offer new and creative means of sharing lessons, resources and assessments among others and facilitate student evaluation and generate analysis, reports that can easily display the areas of strength or areas that need continued improvement.